I love Brussels sprouts, so good. This time of year they are in season and plentiful. One of my favorite things to do with them is roast them. If you’ve been reading this blog at all, this will not surprise you! The days of mushy steamed Brussels sprouts are over. If that was your experience with Brussels sprouts and you haven’t had them since, try this, it might change your mind. Preheat oven to 400 degrees. Wash sprouts and remove the loose outer leaves, cut in half. Lay out on a cookie sheet. Drizzle with olive oil, sprinkle with a couple pinches of sea salt and a pinch or two of crushed red pepper. 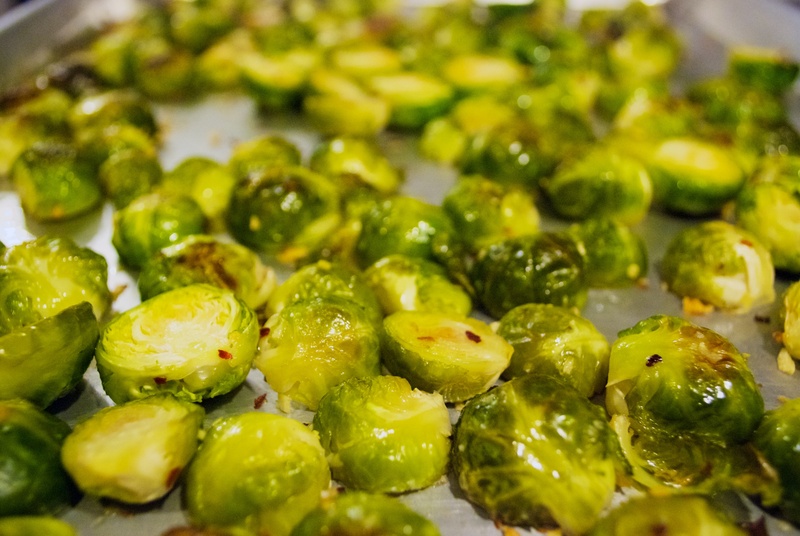 Put in the oven for about 15-20 minutes, until sprouts begin to brown and are soft, but not mushy! If you want, squeeze the juice of about a half a lemon on them when you take them out. This will mellow out the flavor a bit. Personally, I like the strong flavor of Brussels sprouts. These are great served right away and also make delicious leftovers to add to salads, rice, or just to eat alone. Enjoy and have a lovely weekend! Sooooo good! I sprinkled with goat cheese after they were done roasting – wow!